What might it mean to say “we are all African, when we listen”? By this, I am not suggesting that we return to the origins tales from over a century ago, when leading musicians and critics made fantastical claims about civilization’s rise from a primal, sonic humanity, as in the German composer and conductor Hans von Bülow’s “In the beginning was rhythm.” Nor am I referring to paleoanthropological theories tracing humanity’s beginnings to the African continent; nor, for that matter, to the Nigerian-born, London artist JJC, whose recording “We are Africans” was an international hit in 2010. My phrase points to something else: namely, that what we take to be the common sense of Western musicality—the conventional understanding of what music should sound like and communicate—is inseparable from the modern history of the African continent. This, to be sure, has been a fraught history, marked by two major tragedies generated from the outside. The first commenced with Africans’ forced, transatlantic displacement as slaves; the second was the result of the continent’s invasion by European colonizers. What emerged in the US and Europe as “our music” over the course of the past 150 years developed directly from both of these tragic legacies. Embracing the notion that we are all African when we listen is a means of recognizing this past in our present. It enables us to re-center our thinking about the cultural history of the US and Europe in order to acknowledge Africa’s audible place within it. In making this claim, it might appear that I am challenging European classical music’s standing at the pinnacle of high art. But I have no quarrel with classical music’s established importance; its legacy of musical innovation and thought still informs how we conceptualize the very idea of music and measure its aesthetic value. I have, instead, a different concern, which is to say that, despite classical music’s lasting significance, it is the sonic world of “Africanity” that best characterizes the listening orders of the West. Despite classical music’s lasting significance, it is the sonic world of “Africanity” that best characterizes the listening orders of the West. Indeed, as far as the realms of the audible go, African musicality, in its many transatlantic iterations, has already won the cultural wars; it has done so in large part with the assistance of the very forces that served to dominate black people. The way we hear and what we tend to like musically are deeply informed by the unintended legacies of African involvement in the West—the result of the displacement of Africans to North America and the subsequent dissemination of their musical practices within the newly capitalized, global markets of modern entertainment. The Africanization of popular sound that begins during the US’s antebellum era and that escalated rapidly around 1900 did not take shape because African-based musical practices possessed some inherent, special value. It did so because of a set of material circumstances having to do with the tragedies of Euro-African contact, which assigned to African-based musical practices a special value, a value that, in turn, motivated the rise of professional black performance. What emerged as the normative stylistic orientation of popular music developed out of the legacies of containment and conquest of African people and cultures, by which a distinctive kind of racially “black” music became the touchstone of a public, musical common sense. The transformation of music has been so profound and enduring that we hardly notice it. But think about this: the quality and character of public sound in the present, indeed over the past century or more, has developed according to the persistence of a conspicuous African audibility heard in cities from Los Angeles to Prague. Many scholars and commentators have long acknowledged this influence, often with clichéd references to the power of “the beat.” These references tend to downplay the radicalism of musical and aesthetic change, relegating the global influence of musical Africanity to a vague, cultural retention (e.g., blue notes, syncopation, etc.). They also obscure the extent to which the overall character of pop music has emerged from a greater idea and practice of black rhythm. Pop has done so not simply by retaining the African musical use of repetition, but by creatively advancing upon it according to a set of beliefs that ideologically specify rhythm as a racial essence, a kind of audible blackness, as a quality of being sonically situated at the core of what we consider to be modern. The concept of “beat,” we might say, has itself been profoundly informed by a racial fantasy about “natural rhythm” sustained from the eighteenth- and nineteenth-century eras of slavery and early colonial encounter. It is what would drive musical innovation in a proliferation of genres from the ragtime era onward, providing a key means by which US black and diasporic African musicians affirmed their claim of their own musical forms. What is especially important in comprehending this argument of audible Africanity is to recognize how, since the beginning of the modern era, African repetition has exceeded practices racialized as “black.” Today, we can hear the primacy of the beat nearly everywhere, from country & western, to European club music, to the many international expressions of rock, jazz, and blues. The priority given to racialized repetition is so pervasive, so deep, that it has affected our aural comprehension of what is right in a given musical production. As an idea caught up in the Western fantasy of race, it represents a veritable knowledge, a beat knowledge informing musicians’ and listeners’ affective and aesthetic experiences worldwide. Racialized, black rhythm, one might argue, now identifies the common denominator of music as such. Indeed, the expanse of racialized concepts of rhythm have reordered the auditory qualities of public culture at large, its influence extending beyond the social field of the popular into the seemingly rarefied domain of musical modernism. Beat knowledge has become a reference point by which classically trained composers craft their art in affirmation or denial of its aesthetic value and influence. The priority given to racialized repetition is so pervasive, so deep, that it has affected our aural comprehension of what is right in a given musical production. As an idea caught up in the Western fantasy of race, it represents a veritable knowledge, a beat knowledge informing musicians’ and listeners’ affective and aesthetic experiences worldwide. A second indication of an African-inspired transformation has to do with timbre and tone. In the early twentieth century, at a moment when European composers were radically challenging the ordering grammar of tonality, US black musicians were introducing styles of lasting, cultural consequence, their pitch-bending techniques and innovative, timbral effects challenging not European music’s harmonic conventions but rather the very nature of equal temperament and diatonicism (i.e., obedient to the constraints of scale-form). The stylistic practices that developed as part of the rhythmic revolution of pop rewrote the rules of playing-style and instrumental intonation—as heard, for example, in circus bands and syncopated orchestras (James Reese Europe), hot jazz (Louis Armstrong), swing ensembles (Duke Ellington Orchestra), Chicago blues (Muddy Waters, Howlin’ Wolf), and gospel, rhythm ‘n’ blues, and soul singing (Mahalia Jackson, Little Richard, Aretha Franklin, James Brown). With the new advances in commercial recording before and after World War II, African and black Caribbean musicians advanced their own contributions to the making of a black transatlantic tonal-character, inspiring a range of genre innovations (rumba, calypso, biguine, compas, ska). With the rise of hip-hop, black music’s enduring push against the strictures of European song-form reached a kind of stylistic apotheosis. Seminal groups of the late 1980s (Public Enemy, NWA) had largely done way with the templates of song form established in the nineteenth century (later revised in Tin Pan Alley) in order to craft a sound largely committed to innovations in tone color, cast against new experiments of the beat. As with beat knowledge, what we might call the Africanization of tone color reorients the orders of performance, proposing a normative “colored sound” or what Amiri Baraka has called Western music’s “brownish” cast. Such tone coloring is pervasive and conspicuous, even if we don’t recognize it immediately. Take, for example, the tendency for pop singers to employ black, gospel inflections, conspicuously present in performances from the Euro Song Contest to the American TV show The Voice. We hear it again at major sports events, in so many gospel-inspired renditions of the “Stars-Spangled Banner,” and yet again in the recorded selections routinely played in chain-store coffee houses such as Starbucks. The “natural voice” of the West—and, indeed, of the global metropolis—is an Africanized one, betraying Africa’s conquering presence resonating globally from the flesh of its former conquerors. We might wonder why this happened in the first place. Why did these intrusions into the norms of European music once upholding racial conceptions of whiteness carry such effect? Why was this African character valued among majority-white populations that had otherwise devalued the actual lives of black people? This is perhaps black music history’s most critical question, the answers being at once complex and contested. But what seems abundantly clear, at the least, is that the embrace of Africanized forms ironically had a lot to do with black people’s social devaluation. In the US, where these patterns first took shape, black music’s claim by white listeners became a way of underscoring racial supremacy over what were deemed an inferior, “naturally musical” people. The pleasure that white majorities obtained from black music related directly to this one-way transaction that sought to affirm white, racial superiority; pleasure aligned with the expropriation of a cultural currency afforded to the music of black people. What undermined this tendency, however—and established a second, critical dimension of aesthetic pleasure—was the inability for white populations to complete the ownership of black music. Because the blackness of black music was racially determined, its exchange to white ownership would never be completed, even when consumers put down money to buy it; such a completion would destabilize the very distinction between black and white. Accordingly, the incompletion of a racialized economic transaction became the basis of aesthetic value, driving an entire history of black and white consumptive behavior. Across the twentieth century, the incompletion or interruption of exchange became a generative principle in the production of an essential, black musical character, its racially based inalienability serving as a key catalyst for a flood of African diasporic creativity. A transatlantic black sound would variously congeal, again and again, bringing to form various qualities of racially conceived black musical distinctiveness to satisfy the Africanized tastes of listeners across the West and around the world. Because the blackness of black music was racially determined, its exchange to white ownership would never be completed, even when consumers put down money to buy it; such a completion would destabilize the very distinction between black and white. We might think of the double character of black musical pleasure as a negative formation, by which the white-majority intention of ownership and its deferral establish the cultural logic of racialized invention. It identifies black music not as something equivalent to European music, but as a creative sound-form that is at once less-than, and more-than, “music.” The valuation of black music as something less-than and more-than “music” develops as part of a greater commodification of culture, its new and “peculiar” forms circulating a greater beat knowledge that re-ordered the character of listening worldwide as it positioned the right of ownership at the center of popular aesthetics. Recognizing the logic producing the Africanization of the audible public not only helps us to understand the appeal of US black music in European cities from London to Paris to Berlin, but also why listeners in, say, 1930s Shanghai, were drawn to black jazz forms. As the cultural critic Andrew Jones shows in his wonderful book, Yellow Music, listeners embraced black forms, together with their Chinese reinterpretations, according to the same discursive fantasies of race, rhythm, and form that circulated globally along with American bands and commercial recordings. Well before the United States’ global dominance after World War II, the world had begun to sound distinctly African. If, indeed, we are all African when we listen, what does it mean to listen to African music of the late- and post-colonial eras, to the music produced and enjoyed for over a half century on the Continent? Some appreciation of the collision of musical Africanity and Western racial thought may help us to recognize how best to engage that musical past, acknowledging the distorting lens of racial representation, by which “Africa” as a sound-world has been repeatedly mediated and recast into a veritable fantasy of global sound. That African popular music developing before and after World War II drew deeply and profoundly from what was an imagined sonic Africa generated in the West is one of the great ironies of the late colonial and postcolonial eras. But it is this same practice of drawing from the outside that also catalyzed the powerful, anticolonial musics accompanying the formal end of European, colonial regimes. Recordings such as E.T. Mensah’s “Ghana Freedom” (1957) and Joseph Kabaselé’s “Indépendance Cha Cha” (1960), and later, Fela Anikulapo Kuti’s copious oeuvre of “Afrobeat” would not have been heard and understood as they were—(they would not have carried such effervescence, such meaningful significance)—had it not been for the racial fantasy of black music, together with the music’s messy background as a racialized subject of contested and capitalized property brought into form as commercial sound recordings. It is fascinating to consider how these very fantasies are now catalyzing new, popular practices specific to the African continent. A transnational blackness in sound is arising, its manifold productions at once affirming and revising the character of a US-based musical Africanity that had developed out of Africa’s first tragedy—and now, by turns, giving rise through the very same mechanisms of global capital circulation to a new, postcolonial African sound resonating from the cities of Lagos, Accra, Nairobi, Kinshasa, and Johannesburg. Finally, we might wonder what of the “real” African music, the precolonial, traditional musics that brought character to the songs of slaves celebrated by W.E.B. Du Bois and that gave rise to the very idea of “black music.” We know of this different music, this music of difference, through a plethora of ethnomusicological field expeditions that documented a musical world of great depth and complexity. What about those practices that were evolving dynamically for centuries before all the interventions and mediations of European contact, before the concept of race generated the massive distorting lens of “blackness” itself? For in the success of African aurality’s inadvertent conquering of the West and the global metropolitan at large, so has it seemingly witnessed the occlusion of its own history, relegated to von Bülow’s primitive “beginning.” The very idea of “black music” would appear to mark that loss. And yet, we are faced anew with a new set of challenges at the moment when the tombs of colonial archives—in London, Paris, Johannesburg, and, most recently, Berlin’s new Humboldt Forum—are releasing for public consumption the seminal recordings produced at the cusp of the early colonial era. It is a question we’ll want to consider seriously, as the recovery of early recordings enables us to ponder a past with perhaps a greater sense of responsibility. For if it is true that we are all African in certain ways, it will behoove the West to reflect collaboratively with the greater African continent in order to consider what it means now to make sound and to listen. Ronald Radano is an ethnomusicologist with a special interest in the history of US Black music and its transnational circulation. He teaches African cultural studies and music at the University of Wisconsin-Madison. There’s always a problem with Daniel Joseph Martinez’s artwork, one attended by the perpetual question, “Just who or what is the subject here?” To ask this question is exactly the point. Excerpt from a screen play. Moji is a US immigration official; Mara is a Romanian woman who has recently married an American, after having known him for only two months. Moji is in charge of her greencard application. Luscious large-scale paintings of the foaming sea, inspired by a lifetime of surfing. In this short story from 2010, the New York Times bestselling author of Crooked Letter, Crooked Letter Tom Franklin thinks about why quitting your job might be a good idea. Is it harder being Muslim in Western Europe than in the United States? Right-wing radicalism has been on the rise across Europe as evidenced by the growing popularity of populist-nationalist parties like Front National in France, or the UKIP in the UK, and is likely to increase further in the wake of the current European refugee and migrant crisis. A review of Anne Applebaum's new book, about the devastating Ukrainian famine of 1932-33. If we could imagine standing in Rome around the year 500 CE, as the old empire had been gradually replaced by new kingdoms, we would see a world in transition. In the first two decades that followed the Chernobyl explosion, the Zone of Alienation was off-limits to all but employees and scientists working in the fenced-off region. Many thought of it as the darkest spot on earth. But this picture changed after 2002, when the Ukrainian government opened the zone to a limited, permitted tourism. Music and musicians from Latin America are an inextricable part of the development of Los Angeles as a modern musical city. The Reconstrucion of Vinh City with the technical and financial assistance of East Germany was part of a large-scale, multilateral recovery program for Vietnam involving socialist and socialist-leaning countries across Asia, Europe, and Latin America. Like the Marshall Plan of post-WWII Europe, an emphasis on industrialization to regenerate the economy channeled massive investments into the rebuilding of infrastructure. As German start-ups aim to duplicate the Silicon Valley model, our alumnus Steve Hill, in his new book Die Startup Illusion, asks if it best serves the European social model. Herewith, an exclusive essay for the Berlin Journal, derived from Hill's Introduction. In this new short story, New York Times Magazine writer Thomas Chatterton Williams details writing in Paris and falling in love, having a mixed-race toddler, and time in Sweden. It is hard to exaggerate the devastation that Boko Haram has unleashed upon vast tracts of the northeast of Nigeria since 2009 and the horror it has wrought by attacks across the country’s Muslim north, including in major cities such as Kano, and the capital, Abuja. Underground publishing in West Germany, circa 1968. Ant Farm’s 1970 “Truckstop Network” was borne of the idea that one could reverse the dreary flow of information by taking it into one’s own hands. The opening pages of Leonard Barkan's new book may amount to the most joyous authobiographical take offs; the book itself will continue with a kind of archaeology of Berlin's Jewish past via a reading of the graves of the cemetery at the Schönhauser Allee. The rise of Trumpism and its threat to the trasatlanticism and decency. Excerpt from a manuscript in progress. Heike: Ahh. So we would love you in Berlin! "The poet does not care about his surroundings, or if he does, he’s making the best of things. He is absorbed in his artistic labor. This was how I wanted to be, who I wanted to be, at least for a while." 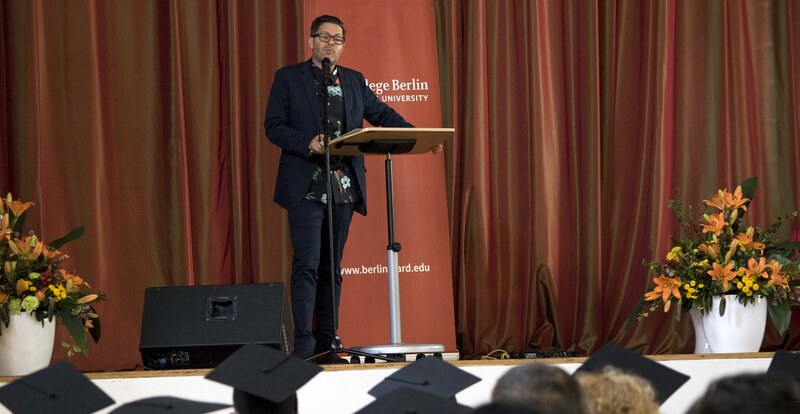 Berlin-based exiled Syrian playwright Mohammad Al Attar spoke with conceptual artist and spring 2016 Academy fellow Mary Ellen Carroll about the theater as a political form of art and about the current situation in Syria. 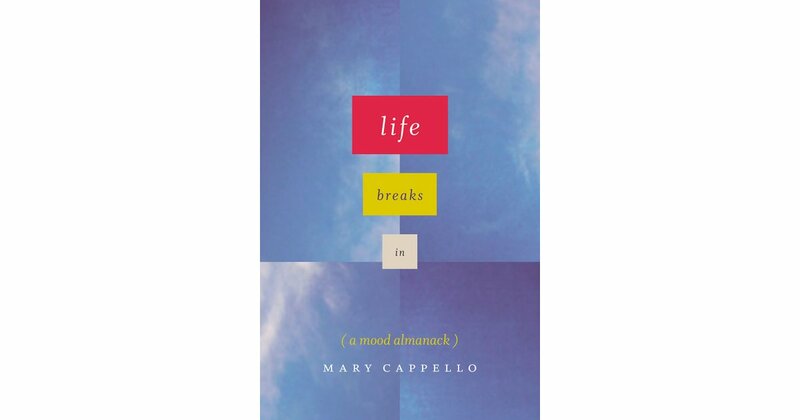 A book review of alumna Mary Cappello's book on mood, and how it works in and with us as complicated, imperfectly self-knowing beings existing in a world that impinges and infringes on us, but also regularly suffuses us with beauty and joy and wonder. A meditation upon the differences between "Dem deutschen Volke" and "We the People." A brief history of undercover policing in early twentieth-century New York and its influence upon the field of sociology.